It wasn’t just talent, though she has it (and I never did). It wasn’t just hours of dedicated practice, though she realised long before I did that desultory efforts with the piano are not enough for success. Her story traces the elusive path of dreams and ambition, and it reveals a steely determination to achieve a succession of personal goals that would leave any life coach breathless in her wake. Gifted in every way, Goldsworthy set herself one target after another: academically, a scholarship to Pembroke, top marks and dux of school; musically, mastering a progression of composers, collecting A+ exam results, prizes in performance and a scholarship to the Texan Christian University. She tells this story with honesty and self-deprecating humour, sharing her earnest adolescent efforts to be like the other girls, her ineptitude behind the wheel of a car, and the compulsive thought processes that guide her through the terrors of rehearsal and performance. Goldsworthy dedicates her story to the wonderful teacher by her side, but it is not the story of Eleanora Sivan. She is a vibrant presence, but we know very little about her really. We do not know when, how or why she abandoned preparing students for international competition in Russia, to teach children in a suburban high school in Adelaide. The easy assumption that it was to escape oppression is swept away by Sivan’s puzzling remark about the death of Prokofiev and Stalin on the same day: ‘Everyone was grieving for Stalin, no-one for Prokofiev. I was child, and very upset that we had lost our beloved leader.’ (p139) Stalin? A beloved leader?? Was this said with irony? What we know of Sivan is her interpretations of music, captured (we assume) by Anna’s father Peter Goldsworthy as he accompanied Anna to her piano lessons until she turned 18 and could drive there herself. For eight years, he was there, ‘listening, day-dreaming, taking notes’ (p11) and he used these notes as the genesis for his novel Maestro. There were times when I found these reproductions of Sivan’s insistence that Anna ‘must learn to hear…must learn to listen’ (p43) a bit trying: without the music to guide me I was floundering like nine year old Anna, trying to understand what she meant. It is, as she says, ‘a difficult thing to transmit to a student: the importance of forming ideas in your imagination first, rather than grasping for them at the keyboard.’ (p42) Equally, it is a difficult thing to transmit to a reader, even one who has trod the same path, to some extent. I lay in the backseat and rehearsed this in my mind. Tragic. Me. Missing out on a childhood. The melodrama of it delighted me; a tear of the most exquisite self-pity formed in my eye and then rushed down my cheek. I let it dry on my skin. If I wiped it away, they would know I had been eavesdropping. Now in her thirties and balancing motherhood and a life in music, she seems to have the balance right. Like my beloved music teacher, Valda Johnstone, who died just a few years ago, she performs and records and she teaches but is not driven to test herself in endless competitions or the international circuit. I think her pupils must be lucky indeed. 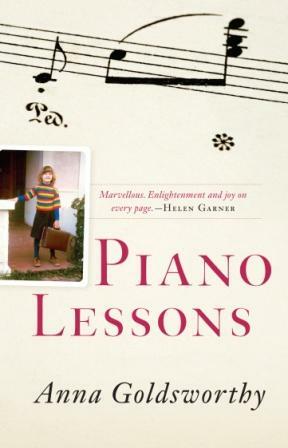 Update 8.4.10 Piano Lessons has been shortlisted for the 2010 NSW Premier’s Prize for Non Fiction. Review copy courtesy of Black Inc Books. This sounds like an interesting book Lisa – particularly with the Peter Goldsworthy connection. (And your person never did send a copy to me despite your kind sugggestion) I never learnt piano but I sat in on my daughter’s lessons for years. That Stalin comment. I can’t help thinking it might have been genuinely felt when she was young – how was she to know? But that she would realise the irony now perhaps?? You’re most welcome to borrow it, just say the word! You’re right about the Stalin comment, I think…and that’s made me think about why Goldsworthy (and the editor) included it. It made my antennae go up, and if I’d been editor I would have asked G why she wanted it in, because at first glance it makes Sivan look like a Stalin sympathiser. Lisa PS My mother never needed to sit in on my lessons, because Miss J lived in the same street as us and so we simply walked to and fro by ourselves. Oh Lisa … so many that I want to read. Is it a quick one? Perhaps when I come down? Stalin. Don’t you think leaving it in rather shows the naivete of youth? Or, maybe too, the ignorance of those under the regime? One does wonder what her parents thought – for her to feel that? Re sitting in on lessons – I think my husband could ride his bike to his, but my kids teachers were always a suburb or few away. I quite enjoyed it – I’d sit there half listening but mostly reading my book. A treasured respite in those years of working and child-rearing! Hello, I absolutely loved this book and found your review when Googling reviews. I have to say though I thought it was pretty obvious that Goldsworthy/Sivan was highlighting the naivete of youth. The very next paragraph starts “She turned back to the piano and relief flooded her face”. Anyway…just my two cents. Good site by the way. Hi Jack, thanks for joining in the conversation. I hope it does well…such a talented family!